New Non Fiction: Ready, Steady, Cook! Almost two-thirds of the winter has now gone! We have had cold and nasty periods of gale winds, hail, snow, rain and storms in the Capital. So now that the school holidays have started, why not come in from the cold and check out Wellington City Libraries’ new range of cooking and baking non fiction in the Children’s collection for your enjoyment and pleasure. Our new range of cookbooks contains information on how to make an assortment of savories and sweets for ideal for breakfast, lunch, dinner, snacks parties, and high tea. Also included are ideas on how to make Italian dishes, Kiwiana themed cupcakes, Narnian themed food and meals that meet the nutritional guidelines of healthy eating. The Silver Spoon for Children. Fancy some Italian this winter? This delightful book holds 40 Italian recipes adapted from The Silver Spoon by a specially commissioned expert on children’s food and nutrition. The recipes have been chosen for their simple instructions, fresh and healthy ingredients and delicious flavor, and are guaranteed to appeal to the fussiest of children, so parents can rest easy knowing that their children will be eating healthily. You will learn how to make your own pizza, spaghetti and ice cream. Every step is described and illustrated to make the recipes easy to follow and there are photographs so that you can see what the finished dishes are suppose to look like. We all know the series (and the movies). Have you ever wished you could travel through the wardrobe and simply taste some of the wondrous food featured? With The Unofficial Narnia Cookbook, you can recreate the delicious meals from Narnia in the comfort of your own home without worrying about the White Witch or epic battles. Menus include more than 150 easy-to-make recipes for breakfast, snacks, lunch, dinner, and of course dessert. Relive the magical and glorious world of Narnia as you cook your way through foods so good, you’ll think Aslan delivered them himself. If you’re visiting your local library, you might also want check out the books and the DVDs. Books: The Lion, The Witch and The Wardrobe, Prince Caspian, The Voyage of the Dawn Treader, The Silver Chair, The Horse and his boy, The Magician’s Nephew and The Last Battle. DVDs (Motion Picture): The Lion, The Witch and The Wardrobe, Prince Caspian and The Voyage of the Dawn Treader. In the mood for quick after-school snacks, impressive dinners and sweet desserts. Then look no further. Little Kitchen is a beautifully designed and photographed collection of forty recipes for children aged six years and up. With clear, step-by-step instructions, each recipe will teach you how to make all the tasty treats you long to eat and when to ask a grownup for help. Included are recipes for: Little Egg and Bacon Breakfast Pies, Minestrone, Yummy Mini Burgers, Meatballs, Tutti Frutti Salad, Gingerbread Snowflakes, and more! Yum! Got the munchies? Want an easy meal in less than 30 minutes? Then Half-hour Hungries is the book for you! This book contains information on 36 awesome dishes for kids to make when the time is short, like Nacho-flavoured popcorn, Sloppy Joes and Croque Monsieur that are bound to satisfy rumbling tummies. Sugar and spice and all things nice. That’s what little girls are made of. And this book goes to show that the proof is definitely in the pudding. (No pun intended) Written by Italian-born, New Zealand based food writer and travel journalist, Alessandra Zecchini, Party Food for Girls is perfect for girls who want to create scrumptious sweet treats, like teapot biscuits, and healthy snacks, like lavash salad rolls for birthday parties and high tea events. Kiwiana Cupcakes, Cake Pops and Whoopie Pies. “Kirsten Day does cupcakes, cake pops and whoopie pies Kiwiana-style, creating delectable treats to celebrate our Kiwi culture. In full colour with never-fail recipes, tips and hints, advice on Kiwiana styling and variations on design.” – Publisher information. Day’s take on Kiwiana styling of cupcakes is fantastic, especially with the Chocolate Kiwi, Chocolate Kiwifruit, Tomato sauce bottle and even Fish and Chips themed cupcakes. This book puts all cupcake recipes you know and heard of to shame. What’s on today? Wednesday 1st May. Special Event: Meet a Tuatara! Tawa Library, 11am: Have you ever met a dinosaur? No? Here’s your chance! Sue Keall from Victoria University is bringing along Spike the Tuatara to Miramar Library. Find out about why Tuataras are so special and learn how we can protect them and make sure they survive for many more generations. This free event is suitable for 5-12 year olds. Places are limited and bookings are essential. Phone Miramar Library on 388 8005 to secure your place. Baby Rock & Rhyme: Perfect for parents and bubs aged 0-2yrs old. Storytimes: fun stories and songs for toddlers, preschoolers and their families. Older siblings are welcome. Find out what’s on at the Kids’ Events page. What’s on today? Tuesday 30th April. 2nd week of the school holidays! The weather looks great today, but we’ve still got some cool stuff happening in our libraries. Take a break from the sunshine, come on in and check it out. Newtown Library, 10.30am: Slip on your jandals and join us for Kiwiana holiday fun! We’ll be reading stories by NZ authors, playing NZ bingo, and holding a rock-stacking competition called Tu Kohatu. Sweet As! Baby Rock & Rhyme: Perfect for mums and bubs aged 0-2yrs old. All events are free and no booking are required. Find out what else is on at our kids’ events page. What’s on Today? Friday 26th April. Cummings Park Library (Ngaio), 11am: Have you ever met a dinosaur? No? Here’s your chance! 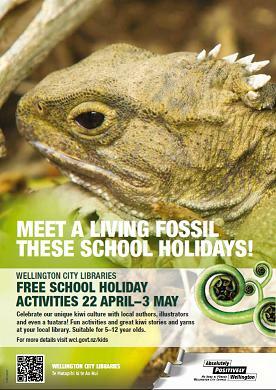 Sue Keall from Victoria University of Wellington is bringing along Spike the Tuatara to Miramar Library. This free event is suitable for 5-12 year olds. Places are limited and bookings are essential. Phone Cummings Park Library on 479 2344 to secure your place. Day 2 of the school holidays! Here’s some more cool free stuff for you to do. Kilbirnie Library, 10.30am: Slip on your jandals and join us for Kiwiana holiday fun! We’ll be reading stories by NZ authors, playing NZ bingo, and holding a rock-stacking competition called Tu Kohatu. Sweet As! Special Event: Author and Illustrator visit! Lucas and Jutta Chisholm, Author and Illustrator of the awesome book ‘Meet Mr. Mr Sunny’, are visiting to run fun activities with you. 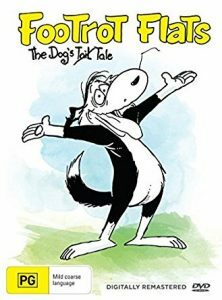 Listen to this cool book being read aloud, find out all about how to write books and even draw and make your own book character. Cool! Wellington Central Library, 11am. No bookings required, suitable for 5-12 year olds. Free. Read and act out one of Margaret Mahy’s most popular books – Down the Back of the Chair and more fun-filled Kiwiana activities. The lovely librarians have some fun tricks up their sleeves for this one. Johnsonville Library, 10.30am. No bookings required, suitable for 5-12 year olds. Free. Don’t forget our fun and popular storytimes during the school holidays. School Holiday activities! Here are the details. Looking for fun? Look no further – we have some awesome school holiday activities planned for you. Best of all – they are free! Monday 22nd April, 11 am, Central Library: Wellington author and illustrator duo, Lucas and Jutta Chisholm will show off their latest creation and teach you how to draw and create your own character from the book. Prepare for hands-on fun with books, drawing and plasticine! Monday 22nd April, 10.30 am, Johnsonville Library: Join us for an interactive story-time where we read and act out ‘Down the Back of the Chair’ by Margaret Mahy. Take part in other ‘Kiwiana’ activities during this fun-filled hour. Tuesday 23rd April, 10.30 am, Ruth Gotlieb (Kilbirnie Library): Slip on your jandals and join us for holiday fun at Ruth Gotlieb (Kilbirnie) Library to celebrate Kiwiana! We will be reading stories by New Zealand authors, playing New Zealand bingo, and holding a rock-stacking competition called Tu Kohatu. Sweet as! Monday 29th April, 11 am, Karori Library: Special Kiwiana story time. Come along for fun stories with a New Zealand twist. Tuesday 30th April, 10.30 am, Newtown Library: Slip on your jandals and join us for holiday fun at Newtown Library to celebrate Kiwiana. We will be reading stories by New Zealand authors, playing New Zealand bingo, and holding a rock-stacking competition called Tu Kohatu. Sweet as! Thursday 2nd May, 11 am, Central Library: What do ANZAC biscuits have to do with ANZAC day? What’s it like being a soldier away from home, missing your family, friends and favourite food? Explore the great ANZAC biscuit and it’s place in history. All our events are listed on the Children’s Events page. All events are free and, unless stated above, no bookings are required. All events are suitable fro 5-12 year olds. Pop along to Island Bay Library on Thursday 22 September, 10.30-11.30 for a special Kiwiana storytime with stories and activities – Make your own piwakawaka or fantail! It’s free and all whanau are welcome – don’t miss out! For more information contact Rose Swindells, phone 383 7464 or 021 227 8206.